In Kwakiutl First Nations mythology, the name ‘Bukwas’ translates to “Wildman of the Woods”. There is a dance and song performed at Potlatches depicting the Bukwas as a haunting figure who is shy and hides his face, and on mornings when he is seen on the beach digging for cockles to eat he shields his eyes from the sunlight, always looking over his shoulder to see if anyone is watching. The image of this ancient ghostly figure—reserved, revered, and incredibly powerful—now lends itself to the cage persona of local indigenous mixed martial arts (MMA) fighter, Chris ‘Bukwas’ Anderson. As the current Welterweight Champion of the Battlefield fight league, one of North America’s premier MMA organizations based in Vancouver, Anderson boasts an undefeated professional record to date of four wins without loss. 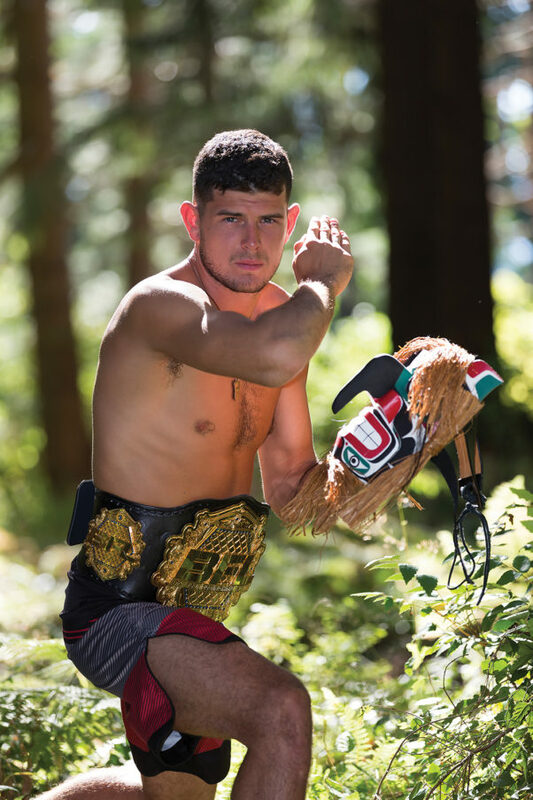 As an amateur, ‘Bukwas’ Anderson was ranked Number One in Canada and held championship belts in the two biggest MMA organizations in the country. MMA is a rapidly growing, full contact combat sport, allowing for the use of a wide range of striking and grappling techniques. The sport’s overriding objective is to bring together martial artists and fighters from different backgrounds—including wrestling, boxing, Muay Thai kickboxing, judo and Brazilian Jiu-jitsu—to find the most superior overall fighting skillset. The brutal and often gory nature of MMA has dictated that it is a polarizing sport like no other. To win, a competitor aims to inflict body and head shots in an attempt to render their opponent unconscious, or submit the foe by choking or distorting their limbs so that they will ‘tap out’, meaning, in effect, that they give up. It is a controversial pursuit, but there can be no doubting the vast array of skills and the endurance of MMA participants. Chris ‘Bukwas’ Anderson is not what one expects to find in the sordid realm of professional cage fighting. Whether or not his personality and world outlook is an anomaly in this world is unclear, but 26 year-old Anderson displays a surprisingly gentle demeanour, a quiet voice, and speaks words both contemplative and candid. His movements are without swagger and bravado, his boyish face bears no trace of being pulverised, and, as the story turns out, his actions and motives reveal a young man fighting for far loftier goals than just a championship belt around his waist. Born and raised in Comox, he attended several local schools before reaching GP Vanier Secondary School, and then dropped out before graduation. “Most of my time in school was spent goofing around or fighting. I tried to play everything in school—basketball, volleyball, soccer and cross country running—but I never really did great at any of these sports. I wasn’t very athletic as a kid,” he says. The ensuing training camp offered Anderson a chance to sober up and find much needed focus. “It was really hard,” he says. “I remember going through withdrawals as I was learning different martial arts and sparring against strong opponents who would constantly get the better of me in the gym. It was the hardest thing I ever did.” But despite the hardships, Anderson won his fight and continued taking fights primarily to stay focused and free of outside distraction. One constant and integral part of Anderson’s life was the presence of his grandmother, a respected Kwakiutl First Nations elder. Halfway into his amateur career (which yielded 10 wins and 2 losses) he began to quietly learn spiritual teachings and a more profound connection to life and land. He asked a lot of questions about his people and his culture and listened with clear intent, rediscovering great pride in his culture and traditions, a sense of spiritual place and personal belonging. Among many lifelong lessons, he learned from his grandmother of the mysterious Bukwas, the ‘Wildman of the woods’. As a fighter, Anderson identified strongly with the vision of Crazy Horse. “I took the vision of Crazy Horse and translated it to form my own vision. It looked something like this—I would show deep respect to my opponents, I would donate my win bonus to charitable causes, and I would practice my culture and come up with a name that identified my ancestry,” explains Anderson. From this rebirth, his version of the Bukwas was born, reflecting both the power of Crazy Horse and the traditions of his own culture. 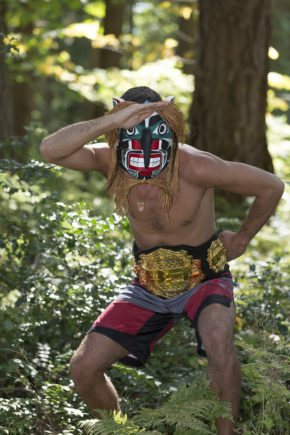 Since that time, he has entered the cage replicating the movements of the wild man, hiding from the lights and cameras and looking over his shoulder, and wearing an ornate Bukwas mask carved and painted by his cousin, Vincent Moon. During this time has won all of his nine fights, not losing a single round in the process, and has collected three belts and been named BC’s most dominant fighter. As a professional cage fighter, in his contract he makes a set amount of money to show up—that figure doubles if he wins. After his first professional victory, he decided to use his win bonus to send money to the Congo to build a well for a community of people who had never had clean water. The process was smooth and rewarding for Anderson. Reminded of the lack of funding on First Nation Reserves for youth programs, Anderson turned his attention to the homefront and funded two Vancouver Island rec centres with brand new sports equipment. “We went to Alert Bay where my grandma was born and we brought the gear and met the kids there. They were very excited and asked for autographs, and that surprised me because no one has ever asked for my autograph before,” he says with a smile. From the solitude of Comox, Anderson watched on with a heavy heart. “It was such a terrible situation, especially for the kids and teenagers of the town,” he says. He reached out to the local Attawapiskat rec centre and learned of something that immediately caught his eye. Surprisingly, once inside the ring, Anderson refers to it as “a terrifying experience. Currently, Anderson is set to begin preparations for his upcoming title defence in October to be held in Vancouver. He has the quiet confidence and measure of a young man with not only devastating power in his fists and feet, but renewed cultural understanding and a sense of belonging on his side. He has a clearly defined purpose which paves the way toward his heady goals. He is no longer a small town kid with small town distractions eating at him, but a proud Kwakiutl man with bold aspirations.